· The cardiac chambers: The heart is the center of the circulatory system and is the organ that pumps blood to the different parts of the body. It consists of two upper receiving chambers—the right atrium and left atrium—and two lower pumping muscular chambers—the right ventricle and left ventricle (Fig. 1.1). o Right atrium: The right atrium receives venous blood from the different parts of the body through the superior and inferior vena cavae and directs the blood to the right ventricle. o Right ventricle: The right ventricle pumps blood to the pulmonary artery for delivery to the lungs. o Left atrium: The left atrium receives oxygenated blood from the lungs through four separate pulmonary veins and delivers blood to the left ventricle. o Left ventricle: The left ventricle pumps oxygenated blood to the aorta for delivery to the different parts of the body. Figure 1.1: Anatomy of the Heart. Diagrammatic representation of the heart showing two upper receiving chambers—the right and left atria—and two lower muscular pumping chambers—the right and left ventricles. Arrows point to the direction of blood flow. · The sinus node and conduction system: The heart has a generator that gives rise to an electrical impulse and an electrical circuit; this allows the cardiac impulse to propagate from atria to ventricles in an orderly sequence. The generator of the heart is the sinus node and the electrical circuit is the intraventricular conduction system (Fig. 1.2A, B). · Intraventricular conduction system: The bundle of His, right and left bundle branches, the fascicular branches of the left bundle branch, and Purkinje fibers constitute the intraventricular conduction system. Their cells are specialized for rapid and orderly conduction of the electrical impulse and may be regarded as the electrical circuit of the heart. · Sinus node: The sinus node is the origin of the cardiac impulse and is the pacemaker of the heart. It is located high within the right atrium near the entrance of the superior vena cava. · Atria: The atria consist of a thin layer of muscle cells that conduct the sinus impulse directly to the atrioventricular (AV) node. The atria also contracts upon arrival of the impulse from the sinus node. With contraction of the atria, additional blood is pumped to the ventricles. · AV node: The AV node is the only pathway through which the sinus impulse can reach the ventricles. It is located at the floor of the right atrium, adjacent to the ventricular septum. The AV node slows down the conduction of the sinus impulse to the ventricles so that contraction of the atria and ventricles does not occur simultaneously. This results in a better cardiac output. 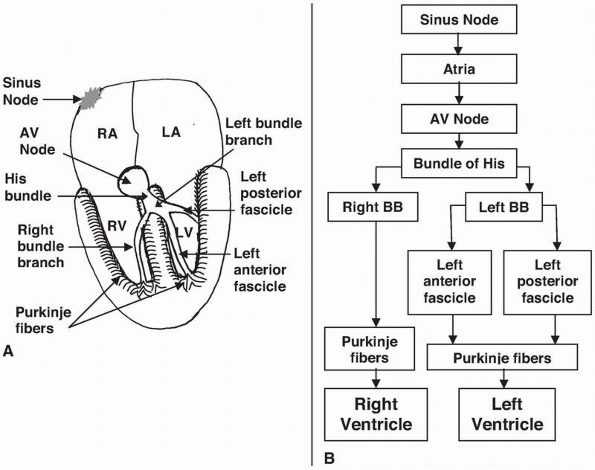 · Bundle of His: The AV node continues into the bundle of His, a short structure that immediately divides into two main branches: the left and right bundle branches. · Right bundle branch: The right bundle branch is a long and thin branch of the His bundle that courses to the right side of the ventricular septum. It terminates into a network of Purkinje fibers in the endocardium of the right ventricle. · Left bundle branch: The left bundle branch is a short branch of the His bundle that spreads to the left side of the ventricular septum in a fanlike fashion forming three distinct fascicles. o Left anterior fascicle: This fascicle courses to the anterior and superior walls of the left ventricle. o Midseptal fascicle: This fascicle branches to the ventricular septum and is intricately connected with the anterior and posterior fascicles. o Left posterior fascicle: This fascicle courses to the posterior and inferior walls before terminating in a network of Purkinje fibers. · Purkinje system: The Purkinje system is the terminal portion of the conduction system consisting of a network of fibers within the endocardium of both ventricles. It spreads the impulse directly to the myocardium, causing both ventricles to contract in synchrony. · Ventricles: The ventricles are the main pumping chambers of the heart. Because the muscles of the ventricles are the thickest structure in the heart, they generate the largest deflection in the electrocardiogram (ECG). Figure 1.2: The Sinus Node and the Intraventricular Conduction System of the Heart. 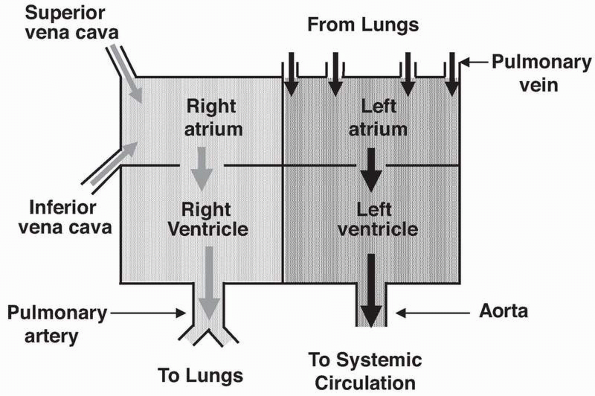 (A) Diagrammatic representation of the sinus node, atria, AV node, and the intraventricular conduction system of the heart. (B) Diagram showing the sequence of conduction of the cardiac impulse from sinus node to the ventricles. AV, atrioventricular; BB, bundle branch; LA, left atrium; LV, left ventricle; RA, right atrium; RV, right ventricle. Figure 1.3: Action Potential of a Muscle Cell, Conducting Cell and Pacemaking Cell. The action potential of a ventricular muscle cell specialized for contraction (A), His-Purkinje cell specialized for impulse conduction (B), and sinus node cell with special properties of automaticity (C). o Muscle cells: Muscle cells are specialized for contraction and are present in the atria and ventricles. o Conducting cells: Conducting cells are specialized for rapid conduction of the electrical impulse and are present within the entire His-Purkinje system. o Pacemaking cells: Pacemaking cells have properties of automaticity and are capable of generating electrical impulses. These cells are present in the sinus node and throughout the His-Purkinje system. o All myocardial cells are electrically polarized with the inside of the cell more electrically negative than the outside. This negative potential is due to the difference in concentration of electrolytes inside the cell compared with outside. Because the cells are polarized, they are capable of being discharged. When the cells are discharged, an action potential is generated. Recordings of action potentials of a ventricular muscle cell, conducting cell from the His-Purkinje system and a pacemaking cell from the sinus node are shown in Figure 1.3. · Action potential of a ventricular muscle cell:When a ventricular muscle cell discharges, an action potential is generated. A recorded action potential is shown in Figure 1.4. The action potential can be divided into five separate phases: 0, 1, 2, 3, and 4. Taken together, the five phases of the action potential represent a complete electrical cycle with phase 0 representing depolarization, phases 1 to 3 representing repolarization, and phase 4 representing rest or quiescence. o Phase 4: A ventricular muscle cell has a resting potential of approximately -90 mV, meaning the cell is more negative inside than outside by about 90 mV. This is primarily because of the higher concentration of potassium inside the cell than outside. This resting state corresponds to phase 4 of the action potential. o Phase 0: Depolarization of the cell corresponds to phase 0 of the action potential. During phase 0, the polarity of the cell changes rapidly from -90 mV to 0 mV, transiently overshooting the point of equilibrium by +20 mV. This rapid depolarization is due to the transit of positively charged sodium from outside the cell to inside and is represented by the rapid upstroke of the action potential. o Phase 1: This corresponds to the return of the overshoot to 0 mV. o Phase 2: This corresponds to the plateau phase of the action potential, which is maintained at approximately 0 mV. o Phase 3: This is due to rapid repolarization returning the polarity of the cell immediately to its resting potential of -90 mV. · Action potential of sinus node cell: The action potential of a sinus node cell, which is a pacemaker cell, is different from a muscle cell. The features of a pacemaker cell that make it different from a nonpacemaking cell are summarized in the diagram (Fig. 1.5). o Spontaneous depolarization: The most important difference between a pacemaker and a non-pacemaker cell is that during phase 4, cells with pacemaking properties exhibit slow spontaneous diastolic depolarization, which is characterized by a slowly rising upward slope of the resting potential. This is due to slowly decreasing negativity of the cell caused by the slow entry of sodium ions into the cell. Because sodium carries positive charges, the cell becomes less and less negative until it reaches a certain threshold (threshold potential), above which the cell automatically discharges. This property is not present in nonpacemaking cells because non-pacemaking cells have flat or very slow rising diastolic slopes during phase 4, which never reach threshold potential. o Resting potential: The resting potential of a sinus node cell is approximately -60 mV and therefore is less negative than the resting potential of a ventricular muscle cell, which is approximately -90 mV. This causes phase 0 to rise slowly resulting only in a small overshoot of 0 to 10 mV (see Fig. 1.5) as compared with that seen in the non-pacemaker cell. · Repolarization: After the cells are depolarized, they have to recover before the arrival of the next impulse. This process of recovery is called repolarization. Repolarization is a longer process than depolarization and includes phases 1, 2, and 3 of the action potential. During repolarization, the cell may not be able to respond to another stimulus. The likelihood of response depends on the electrical status of the cell (Fig. 1.6). o Absolute refractory period: The cell is unable to respond to any kind of stimulus during this period. It includes phases 1 and 2.
o Effective refractory period: The cell is able to generate a potential; however, it is too weak to be propagated. This includes a small portion of phase 3.
o Relative refractory period: The cell is partially repolarized and may be able to respond to a stimulus if the stimulus is stronger than usual. This period includes a portion of phase 3 extending to threshold potential, which is about -70 mV. o Supernormal phase: The cell may respond to a less than normal stimulus. This period includes the end of phase 3 when repolarization is almost complete and has reached a potential that is more negative than the threshold potential of -70 mV. Figure 1.4: Action Potential of a Ventricular Muscle Cell. The action potential of a ventricular muscle cell is shown. Phase 4 corresponds to the resting potential, which is approximately -90 mV. When the cell is depolarized, the potential abruptly changes from -90 mV to +20 mV and is represented by a rapid upstroke or phase 0. Phase 1 returns the overshoot to neutral. Phase 2 corresponds to the plateau phase in which the potential is maintained at 0 mV for a constant duration. Phase 3 returns the potential rapidly to resting baseline of -90 mV. Figure 1.5: Action Potential of a Sinus Node Cell. The action potential of a sinus node cell is shown. The resting potential is approximately -60 mV and is less negative than the resting potential of a ventricular muscle cell, which is approximately -90 mV. Slow spontaneous depolarization is present during phase 4. Phase 0 is slow rising with only a small overshoot. These features differentiate a pacemaking cell from a non-pacemaking cell and are highlighted. Figure 1.6: Repolarization and Refractory Periods. Repolarization includes phases 1 to 3 of the action potential. The absolute refractory period includes phases 1 and 2 in which the cell cannot be stimulated by any impulse. The effective refractory period includes a small portion of phase 3 in which a stimulus can elicit a local response but not strong enough to be propagated. Relative refractory period is that portion of phase 3 that extends to threshold potential. The cell will respond to a stimulus that is stronger than normal. The supernormal phase starts just below threshold potential where the cell can respond to a stimulus that is less than normal. RP, refractory period. · The sinus node: The sinus node is located in the superior and lateral border of the right atrium. The most cranial portion starts from the epicardium at the junction of the superior vena cava and right atrium. Its most caudal portion is located subendocardially. The sinus node contains pacemaker cells that are widely distributed throughout its entire length. These cells have properties of automaticity and are capable of discharging spontaneously. Although there are other cells in the heart that are also capable of discharging spontaneously, the cells in the sinus node have the fastest rate of discharge. The sinus node therefore is the pacemaker of the heart. The sinus node is supplied by the sinus node artery that originates from the right coronary artery 60% to 65% of the time. The rest of the vascular supply originates from the left circumflex coronary artery. · Internodal tracts: There are three internodal tracts connecting the sinus node to the AV node namely the anterior, posterior, and middle internodal tracts. The significance of these internodal tracts is uncertain because the sinus impulse is conducted to the AV node through the atria. · The AV node: The AV node is smaller than the sinus node and is located in the lower right atrium just above the insertion of the septal leaflet of the tricuspid valve and anterior to the entrance of the coronary sinus to the lower right atrium. The AV node consists of three areas with distinct properties: the upper, middle, and lower portions. The upper portion also called AN (atrionodal) region connects the atria to the middle portion, which is called N (nodal) region. The lower portion, also called NH (nodo-His) region, connects with the bundle of His. The middle region is primarily responsible for delaying AV conduction. It is also where acetylcholine is released. It has no automatic properties in contrast to the upper and lower regions, which contain cells with properties of automaticity. In 90% of patients, the AV node is supplied by the AV nodal artery, which is a branch of the right coronary artery. In the remaining 10%, the AV node artery comes from the left circumflex coronary artery. · The His-Purkinje system: The AV node continues as the His bundle, which immediately divides into the right and the left bundle branches. The right bundle branch is a direct continuation of the bundle of His and continues down the right side of the interventricular septum toward the right ventricular apex and base of the anterior papillary muscle. The left bundle branch fans into several branches. These branches can be grouped into three main subdivisions or fascicles: the anterior, midseptal, and posterior fascicles. These fascicles are interconnected with each other. The significance of the midseptal fascicle is uncertain, although it is probably responsible for the initial depolarization of the ventricular septum. The right bundle branch and the fascicles end into a network of Purkinje fibers over the endocardial surface of both ventricles. Conduction across the His-Purkinje system is not significantly affected by sympathetic and parasympathetic influences. The blood supply of the His bundle comes from both anterior and posterior descending coronary arteries through their septal branches. · There are three special types of cells in the heart, each with its own distinctive electrophysiologic property. They include muscle cells such as those of the atria and ventricles, conducting cells such as those of the His-Purkinje system, and pacemaking cells such as those of the sinus node. o Potassium—the concentration of K+ is 30 to 50 times higher inside than outside the cell. o Sodium—the concentration of Na+ is reversed from that of potassium and is almost 10 times higher outside than inside the cell. o Calcium—the concentration of Ca2+ is higher outside than inside the cell. · The cell membrane is relatively impermeable to electrolytes. The movement of ions into and out of the cell membrane is controlled by channels that are specific to certain ions. Na+channels are present that are specific only for sodium ions. K+ and Ca2+ channels are also present that are specific only for potassium and calcium ions, respectively. These ions, however, cannot enter into and out of the cell any time. The channels open and close only at given moment. In other words, they are gated. The voltage of the cell membrane controls the gates; thus, opening and closing of these channels are voltage sensitive. Channels that are specific only for sodium ions, called fast sodium channels, are closed when the potential or voltage of the cell is -90 mV (resting potential). The fast sodium channels will open only when the cell is depolarized, resulting in rapid entry of sodium ions into the cell. This corresponds to the rapid upstroke (phase 0) of the action potential. · The sodium pump: The resting potential of muscle cells in the ventricles is approximately -90 mV. It is slightly less in the atria. During the resting state, the cell membrane is impermeable to sodium. A higher concentration of sodium is maintained outside the cell compared with inside the cell, because of the presence of a Na+/K+ pump located in the cell membrane. The Na+/K+ pump exchanges three Na+ ions from inside the cell for two K+ ions outside the cell. This exchange process requires energy, which is derived from the hydrolysis of adenosine triphosphate by the enzyme sodium-potassium adenosine triphosphatase (ATPase). Because there are three ions of Na+ exchanged for two ions of K+, a positive ion is lost during the exchange making the inside of the cell more negative. o The increasing negativity of the cell when Na+ is exchanged for K+ is due to the presence of large negatively charged proteins inside the cell. These large proteins are unable to diffuse out of the cell because of their size. Thus, when three ions of Na+ exit the cell in exchange for two ions of K+ entering the cell, the large proteins will have one negative charge that is not neutralized, making the inside of the cell more negative until a potential of -90 mV is reached. o Mechanism of action of digitalis: If the Na+/K+ AT-Pase pump is inhibited, sodium is removed through the Na+/Ca2+ exchange mechanism. Sodium inside the cell is exchanged for calcium, which causes calcium to accumulate within the cell. This increase in intracellular calcium through inhibition of the Na/K ATPase pump is the mechanism by which digitalis exerts its inotropic effect. In the presence of digitalis toxicity, this exchange can continue even after the cell has completed its repolarization (beyond phase 3). This may cause the potential of the cell to become transiently less negative, resulting in delayed afterdepolarization. Such afterdepolarizations do not always reach threshold potential. In the case when threshold potential is reached, it may result in repeated oscillations of the cell membrane and can cause tachycardia due to triggered activity. · An action potential has five phases—phases 0, 1, 2, 3 and 4. A complete electrical cardiac cycle includes depolarization (which corresponds to phase 0), repolarization (phases 1, 2, and 3), and a period of rest or quiescence (corresponding to phase 4 of the action potential). o Phase 0: Phase 0 corresponds to the very rapid upstroke of the action potential. § Phase 0 starts when the muscle cell is depolarized by the sinus impulse, which is propagated from one cell to the next adjacent cell. When the cell is depolarized, the fast Na+ channels in the cell membrane are activated, allowing sodium ions to enter the cell. Because sodium ions are positively charged, they neutralize the negative ions making the potential inside the cell less negative. After the threshold potential of approximately -70 mV is reached, all fast sodium channels open, allowing sodium, which is approximately 10 to 15 times higher outside than inside the cell, to enter rapidly. The explosive entry of Na+ into the cell is the cause of the rapid upstroke of the action potential where the polarity of the cell not only becomes neutral (0 mV) but will result in an overshoot of approximately +20 to +30 mV. § The entry of Na+ into the cell occurs only over a fraction of a second, because the fast sodium channel closes immediately when the membrane potential becomes neutral. After the fast sodium channel closes, it cannot be reactivated again and will not reopen until the potential of the cell is restored to its original resting potential of -90 mV. § Depolarization or phase 0 of the action potential is equivalent to the R wave (or QRS complex) of a single myocardial cell. Because there are millions of myocardial cells within the ventricles that are simultaneously depolarizing, it will take approximately 0.06 to 0.10 seconds to depolarize all the myocardial cells in both ventricles. This period corresponds to the total duration of the QRS complex in the surface ECG. Thus, when there is left ventricular hypertrophy or when there is bundle branch block, the duration of the QRS complex becomes wider because it will take longer to activate the entire ventricle. § After depolarization, the cell has to repolarize so that it can prepare itself for the next wave of excitation. 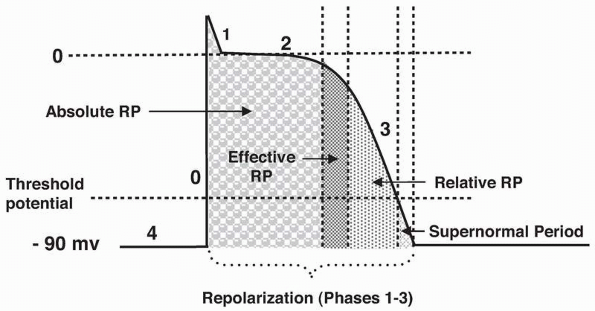 Repolarization includes phases 1 to 3 of the action potential. o Phase 1: Early rapid repolarization starts immediately after phase 0, with the return of the polarity of the cell from approximately +20 to +30 mV to almost neutral (0 mV). § The decrease in potential from +20 to +30 mV to 0 mV is due to the abrupt closure of fast sodium channels and transient activation of the potassium channels causing outward movement of K+. This transient outward movement of potassium is more prominent in the epicardium compared with endocardium, which may explain the shorter action potential duration of epicardial cells compared with endocardial cells. This difference in action potential duration is clinically important because this can favor reentry (see Brugada syndrome, Chapter 23, Acute Coronary Syndrome—ST Elevation Myocardial Infarction). § In the surface ECG, phase 1 and early phase 2 coincides with the J point, which marks the end of the QRS complex and beginning of the ST segment. o Phase 2: Phase 2 represents the plateau phase in which the potential of the cell remains unchanged at approximately 0 mV for a sustained duration. § The opening of the fast sodium channels during phase 0 of the action potential is also accompanied by the opening of the calcium channels when the voltage of the cell has reached approximately -40 mV. Unlike the fast sodium channel that opens and closes transiently, the flow of calcium into the cell is slower but is more sustained. Because the cell membrane is much more permeable to potassium ions than to other ions and because there is a much higher concentration of potassium inside than outside the cell, potassium leaks out of the cell (loss of positive ions), counterbalancing the entry of calcium into the cell (gain of positive ions). These two opposing forces maintain the polarity of the cell in equilibrium at approximately 0 mV for a sustained duration that corresponds to the plateau of the action potential. § The entry of calcium into the cell also triggers the release of more calcium from storage sites in the sarcoplasmic reticulum. This “calcium-triggered calcium release” mechanism is responsible for initiating contraction of the muscle cell. Throughout the duration of phase 2, the cells in the ventricles remain in a sustained state of contraction. During this period, the cells remain absolutely refractory and cannot be depolarized by an external stimulus. § Phase 2 corresponds to the ST segment in the ECG, which normally remains isoelectric throughout its duration. o Phase 3: Phase 3 represents rapid ventricular repolarization. During phase 3, the polarity of the cell becomes more negative until it reaches its original resting potential of -90 mV. § The increasing negativity of the cell during phase 3 is due to inactivation of the calcium channels with decreased entry of calcium into the cell. However, the efflux of potassiumout of the cell continues, making the potential of the cell more negative until it reaches -90 mV. After the resting potential of -90 mV is reached, repolarization of the cell is complete, and the cell is again ready to be depolarized. § Phase 3, or rapid ventricular repolarization, corresponds to the T wave in the ECG. The end of the repolarization period corresponds to the end of the T wave and marks the beginning of phase 4.
o Phase 4: Phase 4 represents the resting or quiescent state of the myocardial cell. The polarity of the cell when repolarization is completed is approximately -90 mV. § During the resting state, the K+ channels in the cell membrane are open while the channels of other ions remain closed. Because of the much higher concentration of K+inside than outside the cell, outward flow of K+ continues. The loss of K+ ions increases the negativity inside the cell. As the potential of the cell becomes more negative, an electrical force is created that attracts the positively charged potassium ions back into the cell against its concentration gradient. Thus, during phase 4, two forces acting in opposite directions cause the K+ ions either to migrate in (because of electrical force) or migrate out (because of difference in K+ concentration across the cell membrane) until a steady state is reached where migration of the K+ into and out of the cell reaches an equilibrium. This corresponds to the final resting potential of a ventricular muscle cell, which is approximately -90 mV. This resting electrical potential can be predicted for potassium using the Nernst equation, where the resting potential of the cell is influenced by the difference in concentration of K+ across the cell membrane and by the electrical forces attracting K+ back into the cell. § In ventricular muscle cells, phase 4 is maintained constantly at approximately -90 mV, making the slope relatively flat. The muscle cell can be discharged only by an outside stimulus, which is the arrival of the propagated sinus impulse. § Phase 4 corresponds to the T-Q interval in the ECG. This interval is isoelectric until it is interrupted by the next wave of depolarization. · The His-Purkinje system is specialized for rapid conduction. The action potential of the His-Purkinje cells is very similar to that of atrial and ventricular muscle cells except that the resting potential is less negative at approximately -95 mV. The more negative the action potential, the faster is the rate of rise of phase 0 of the action potential. This results in a more rapid (steeper) slope of phase 0, a higher overshoot and a more prolonged duration of the action potential. This explains why conduction of impulses across the His-Purkinje fibers is approximately five times faster than ordinary muscle cells. · Pacemaker cells in the sinus node and AV junction have properties of automaticity. These cells can discharge spontaneously independent of an outside stimulus. Muscle cells in the atria and ventricles, in contrast, do not possess the property of automaticity. However, they may develop this property if they are injured or become ischemic. · The action potentials of automatic cells of the sinus node and AV node differ from those of non-pacemaker cells. Most importantly, they demonstrate a slow spontaneous diastolic depolarization during phase 4 of the action potential. These differences are discussed next. § During phase 4, the resting potential of the automatic cells exhibit spontaneous depolarization. The potential of the pacemaker cell becomes less and less negative until it reaches threshold potential. This decreasing negativity of the resting potential is called slow spontaneous diastolic depolarization. This is the most important property that differentiates a pacemaking cell from a non-pacemaking cell. The non-pacemaking cell has a flat diastolic slope during phase 4 and does not exhibit slow spontaneous depolarization. Thus, the potential of the non-pacemaking cell never reaches threshold. § The presence of spontaneous diastolic depolarization is due to the presence of sodium channels that are open during diastole. These sodium channels are not the same as the fast sodium channels that are responsible for phase 0 of the action potential. They are activated immediately after the cell reaches its most negative potential, causing sodium ions to enter the cell slowly. This slow entry of sodium into the cell is called pacemaker or funny current. This renders the polarity of the cell during phase 4 less and less negative until the threshold potential is reached. § Also during phase 4, the resting potential of pacemaking cells of the sinus node measures approximately -50 to -60 mV and is therefore less negative than the resting potential of atrial and ventricular muscle cells, which measures approximately -90 mV. This less negative potential of no more than -50 to -60 mV causes the fast sodium channel to be inactivated permanently. The resting potential of the cell has to be restored to -90 mV before the fast sodium channels can be activated. Thus, phase 0 of the action potential of the sinus node and pacemaking cells of the AV junction is not due to the entry of sodium through fast sodium channels, but is mediated by the entry of calcium into the cell. After phase 4 reaches threshold potential, which is approximately -40 mV, the calcium channels open, resulting in the entry of calcium into the cell, which causes phase 0 of the action potential. § Among all cells of the heart with pacemaking properties, the cells in the sinus node have the fastest rate of rise during phase 4 of the action potential. This accounts for why the sinus node has the fastest cyclical rate per minute and is the pacemaker of the heart. Other cells with automatic properties can be found in parts of the atria, AV junction, His-Purkinje system, and muscle cells of the mitral and tricuspid valves. Although these cells also exhibit slow diastolic depolarization, the rate of rise of the diastolic slope of phase 4 of these cells is much slower. Thus, these cells will be discharged by the propagated sinus impulse before their potential can reach threshold potential. § There is an hierarchical order in the AV conduction system in which cells that are closest to the AV node have the fastest rate of rise during phase 4 of the action potential compared with cells that are located more distally. Thus, when the sinus node fails as the pacemaker of the heart, cells in the AV node at its junction with the bundle of His usually come to the rescue because these automatic cells have the fastest rate compared with other potential pacemakers of the heart. § As previously mentioned, the fast sodium channels do not play any role in triggering phase 0 of the action potential in the pacemaker cells of the sinus node and AV junction since the resting potential of these cells are not capable of reaching -90 mV. Thus, the fast sodium channels remain closed and do not contribute to phase 0 of the action potential. § Depolarization of the cell occurs through calcium channels that open when the resting potential of the cell spontaneously reaches -40 mV. § Because the resting potential is less negative at -60 mV and phase 0 is mediated by calcium ions, the rate of rise of phase 0 is slower. This results in a slope that is less steep with a lower overshoot than that of muscle cells of the atria and ventricles. · The myocardial cell needs to repolarize before the arrival of the next impulse. If complete repolarization has not been achieved, the cell may or may not respond to a stimulus, depending on the intensity of the stimulus and the extent to which the cell has recovered at the time the stimulus is delivered. Not surprisingly, refractory periods are defined according to the phase of the action potential at which the impulse arrives. o Absolute refractory period: The absolute refractory period is the period in the action potential during which the cell cannot respond to any stimulus. This period includes phase 1 and phase 2 of the action potential. o Effective refractory period: The effective refractory period is the period during which the cell can be stimulated; however, the action potential that is generated is not strong enough to propagate to other cells. This period includes a short interval of phase 3 (approximately -25 mV). o Relative refractory period: The relative refractory period starts from the end of the effective refractory period and extends to a potential slightly less negative than -70 mV, which is the threshold potential. Not all of the fast sodium channels are fully recovered at this time. Thus, the potential generated has a lower amplitude and a slower rate of rise of phase 0 of the action potential. The impulse will still be propagated but conduction velocity is slower. o Supernormal period: The cell may respond to less than ordinary stimuli if the cell is stimulated at a potential that is slightly below (more negative than) its threshold potential of -70 mV. The potential of the cell would therefore be only a few millivolts from becoming threshold potential. Thus, a smaller than normal stimulus is sufficient to excite the cell. This short interval corresponds to the supernormal period of repolarization. Conover MB. Normal electrical activation of the heart. In: Understanding Electrocardiography. 8th ed. St. Louis: Mosby; 2003:8-22. Dunn MI, Lipman BS. Basic physiologic principles. In: Lipman-Massie Clinical Electrocardiography. 8th ed. Chicago: Yearbook Medical Publishers Inc; 1989:24-50. Greineder K, Strichartz GR, Lilly LS. Basic cardiac structure and function. In: Lilly LS, ed. Pathophysiology of Heart Disease. 2nd ed. Baltimore: Lippincott Williams & Wilkins; 1993: 1- 23. Shih H-T. Anatomy of the action potential in the heart. Texas Heart J. 1994;21:30-41.